Maybe I’m not the only mom who’s struggled to teach her children to be thankful? It seems like in spite of all we do for our children, they often respond with ingratitude. Because of sin, they often suffer from a sense of entitlement, believing they should receive everything they desire. Thankfulness doesn’t come naturally. It’s our job as parents to train our children to be thankful. 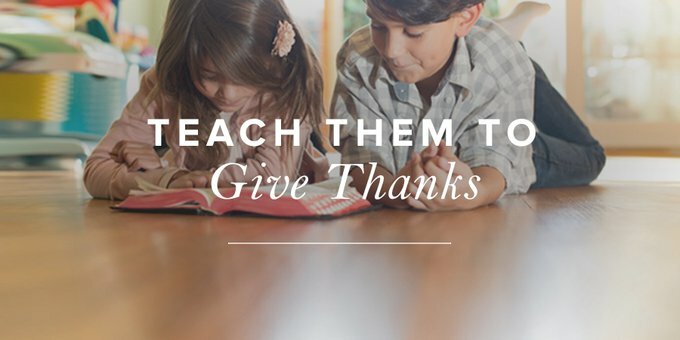 Teach them what they should be the most thankful for: the gospel. Teach them how we’ve all broken God’s law (Rom. 3:23) and that the consequence is death (Rom. 6:23). Jesus paid the price for our rebellion, providing the only way for all who repent and believe to be God’s children and heirs along with Him (Rom. 8:17). What do our children have to be thankful for? The fact that God loves them so much. And because of His great love, He sent His Son to pay for their sins. Children don’t naturally think about the cost of things. It’s our job to teach them what the Bible says is the cost of their sin, what it cost God to secure their salvation, and the cost of their rejection of Him. Teach your children to recognize God’s grace in their lives. Don’t allow them to give in to the sense of entitlement their flesh provokes. Help them learn they don’t deserve anything but have a heavenly Father who gives them everything. In 1 Corinthians 4:7, Paul asks, “What do you have that you did not receive?” Our kids need our help to recognize grace, to see that every good and perfect gift is from above (James 1:17). If you want your kids to be thankful, show them how. Children are expert imitators. Little boys love to cut the grass like Dad, following him around the yard with their toy lawnmowers. Little girls spend hours playing with their kitchen sets. Why? Because they want to be like Mom as she prepares meals for the family. Train your children to be grateful by being grateful. Speak it. Do it. Give thanks to the LORD, for he is good (Ps. 107:1). We know God wants us to be thankful, but are we doing it (James 1:22)? Do your children hear you thanking a friend for her visit? Do they hear you thanking your pastor for the week’s sermon? Do they ever see you taking the time to write a thank-you card? Would your children say that you reflect Colossians 2:7 by “abounding in thanksgiving”? As you speak thanksgiving with your lips, ask Him to give you thankfulness in your heart (Col. 3:16). Recognize the grace shown to you, and respond with gratitude. Set the example for your children. We have a rule in our house that you’re not allowed to complain. One of my sons excels in finding the bad in any situation. When he tries to complain about something, I immediately ask him to tell me something he’s thankful for. My goal is to cultivate an attitude of thanksgiving in him. It’s a process. He continues to attempt to complain about things, and I continue to attempt to squash that harmful desire in him and work at growing his awareness of God’s grace. Sometimes my boys say, “Mom, I don’t want to eat these vegetables.” I respond by saying something like, “Thank you, Mom, for making me a healthy dinner!” Then I make them repeat the sentence, and they do, sometimes laughing while doing so. Instead of thinking about how they don’t enjoy eating brussel sprouts, I want them to be thankful for the provision of healthy food. God has given parents authority over their children (Eph. 6:1). We decide, based on God’s Word, what to allow in our homes and what to reject. Use your authority to cultivate grateful hearts in your children. Reject anything that threatens your children growing in grace. Gratitude reminds us who we are and who God is. We are not self-sufficient. He is our sufficiency. Paul says in 2 Corinthians 3:5, “Not that we are sufficient in ourselves to claim anything as coming from us, but our sufficiency is from God.” He supplies our every need (Phil. 4:19). Like the Psalmist, we say, “As for me, I am poor and needy, but the Lord takes thought for me" (Ps. 40:17). God is our Father, and we depend on Him for everything. Our children need help to rightly see their relationship to God. We help by praying for God to give them a heart that’s thankful. We help by cultivating a heart of gratitude in them. As we strive to this end, we must remember our enemy in this process. Satan is a threat to our children growing in grace and responding with thankful hearts to God. He hates our children and wants to destroy them. Fight for your children by cultivating their hearts toward the Lord. Pray for God to give them hearts that depend on Him, and praise Him for His provision. I want my children to be grateful, and I want them to see my gratitude. I want my family to magnify the Lord by showing our thankfulness to Him. I want my family to be so grateful for His grace that we can’t help but show grace to others. This is why I pray for God to stir our hearts toward Him and model the outpouring of my own heart for my kids to see. What about you? What do you want for your family? God has given us the blessing of children and the responsibility of training them. By His grace, be grateful and teach your children to be grateful, too.